Garam means warm or hot and masala means blends of spices. 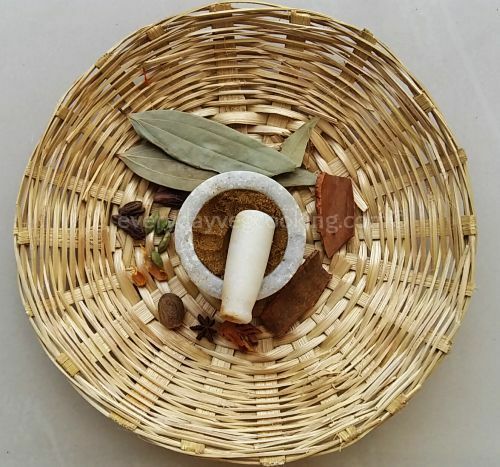 Garam masala is the combination of simple spices available in the kitchen. 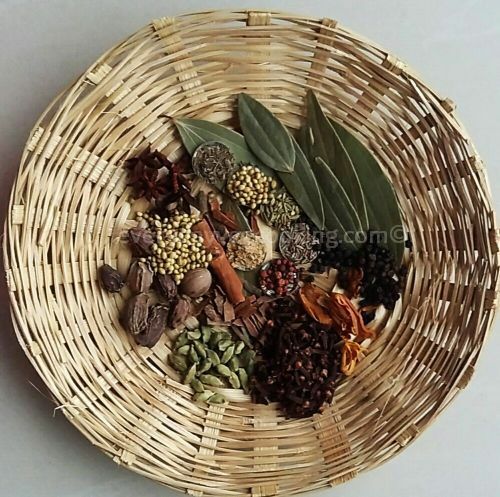 The spices used to make garam masala are digestive and have medicinal properties. During the winter season, use of garam masala in food can help in keeping the body warm, which is good for health and digestion. In north India, garam masala is an important spice which is available on every kitchen shelf. Garam masala is used throughout the year but in winter, it holds an important place in every kitchen. Just little bit of garam masala adds a nice aroma and makes any simple recipe flavorful and enriched with taste. . Note: Always use fresh spices to make garam masala. Making garam masala at home is very easy . Break nutmeg, black cardamom , green cardamom and check properly, if there are worms discard it and replace it . With the clean and dry kitchen towel wipe the bay leaves, cinnamon sticks, black pepper, cobra saffron, cloves, mace and star anise. Clean fennel seeds, caraway seeds, cumin, coriander seeds remove stones and debris from it. Sun-dry all the spices or dry roast all the ingredients (except ginger powder) one by one on a low flame till a nice aroma is obtained. Transfer roasted ingredients to a plate and let them cool completely. Grind all the ingredients into a fine powder and, if necessary, sieve it. Store garam masala powder in air tight jar. Thanks a lot Ranjana Shankar ji, one’s you try this recipe, I am sure you will stop buying ready to use garam masala from market. Thank you for the recipe which I’m going to try soon. My question is, what if there is no Nag Kesar? Any replacement or should I just skip it? If you don’t have nag kesar just skip it. Thank you so much for replying! Another doubt, one *whole* Jaifal and has to be roasted as well? Planning to make it today! Crush one jaifal and roast it with other spices . Hope you like garam masala .